Who Wants To Win A Hat? Every once in a while, The RHOK gets an opportunity to host a giveaway. This is one of those times. And BOY OH BOY are we excited about it! With summertime coming, you will need one of these adorable caps from The Little Dragonfly. I mean you will really NEED one. And one of our lucky readers will get to have one for free! The lucky winner will choose a hat color (light pink, white or black) and a thread color for their initials to be monogrammed on the hat which will be shipped to them for free! Leave a comment on this post. Please make sure we have your email address. As much as we would love to give you entries for Facebook "likes" and "shares" we cannot. Rules and regulations over at Facebook prevent us from adding this to our contest. We would, however, appreciate any new "likes" and your "shares" to promote our giveaway! Please help us spread the word! 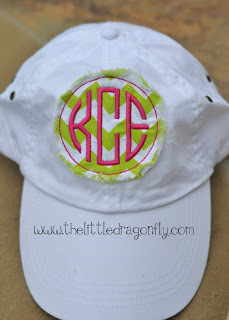 Be sure to check out the other adorable items available at The Little Dragonfly on her blog, Facebook page or even etsy. If you don't win, I have good news! You can purchase your own. 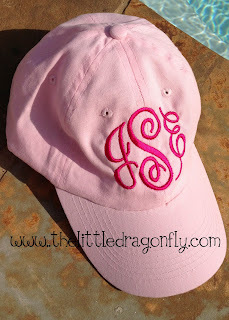 The applique hat costs $22 and the monogram only costs $18. If you mention The RHOK, you will get free shipping. Yup. Free shipping for our RHOK'n readers! I'll be wearing my hats out by the pool. How about you? This RHOK'n giveaway opportunity is available to US residents aged 18 or older. Past giveaway winners from Little Dragonfly are not eligible to win. Giveaway runs from May 15th until May 30th at noon. The RHOK will assign numbers to those commenting then choose a winning number using Random.org. Winner will be contacted by email and have 48 hours to respond. If the winner does not respond in 48 hours, a new winner will be chosen using Random.org.